Superfood Concentrates, Herbal Adaptogens, Probiotics and More! Many of us do not eat the recommended nine servings of fruits and vegetables daily, that is why ORAC Energy Greens is the perfect supplement to provide the antioxidant protection we all need. 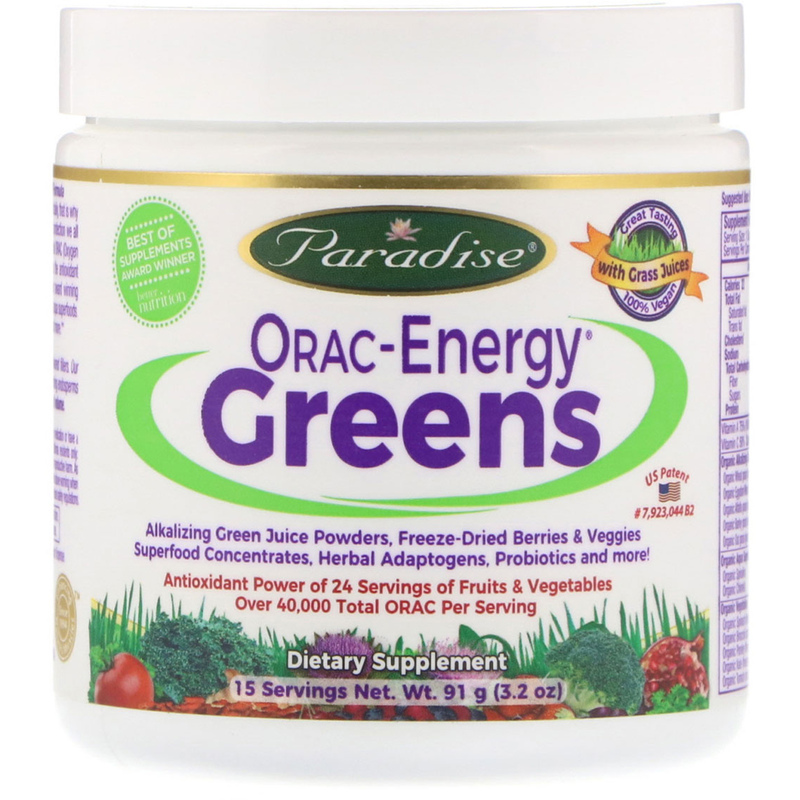 Bursting with more than 50 ingredients and containing over 40,000 total ORAC (Oxygen Radical Absorbance Capacity) per serving ORAC-Energy Greens provides the antioxidant power of more than 24 servings of fruits & vegetables in every scoop. 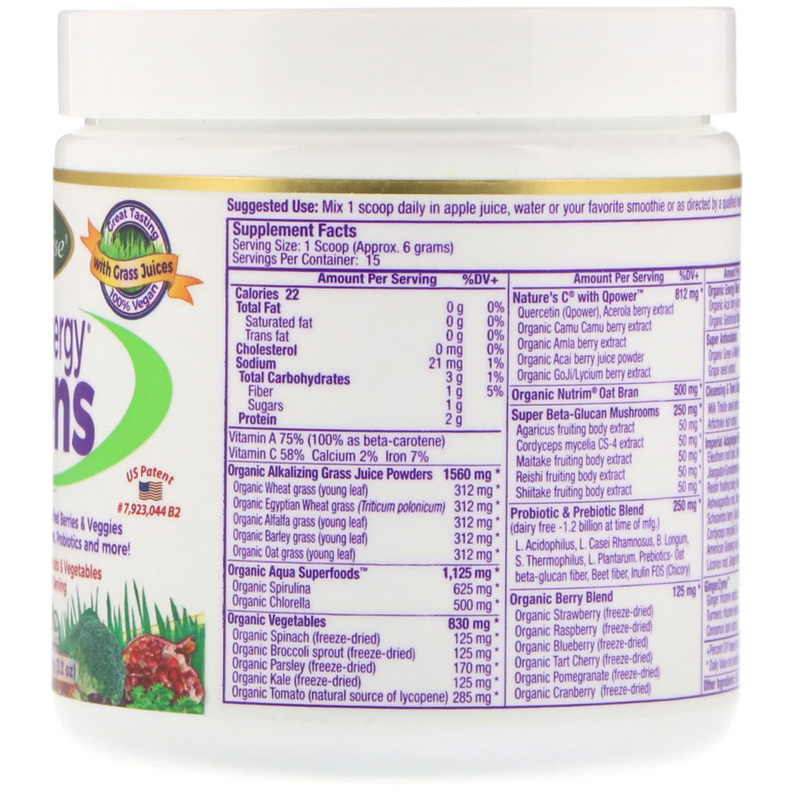 Our award winning patented greens includes highly bioavailable & alkalizing grass juice powders, aqua superfoods, freeze-dried berries & veggies, stress-harmonizing adaptogens, probiotics, and more. Mix 1 scoop daily in apple juice, water or your favorite smoothie or as directed by a qualified health care professional. 100% vegan, soy free, dairy free, non gmo. No added sweeteners or flavored fillers. Our grass juice powders are harvested from young grasses before the gluten containing endosperms develop and are gluten free. Settling does occur. Product sold by weight not volume. Keep in a cool dry place, out of the reach of children. If you are pregnant, nursing, taking any medication or have a medical condition, please consult your healthcare practitioner before taking any dietary supplement. California residents only: warning: This product contains a chemical known to the State of California to cause birth defects or other reproductive harm. As part of the natural growth process plants absorb elements, such as lead from the soil. California law requires the above warning when certain chemicals such as lead are detected. This product and all other Paradise products comply with all Federal safety regulations. L. Acidophilus, L. Casei Rhamnosus, B. Longum, S. Thermophilus, L. Plantarum.